Table Tennis is similar to many other sports where there are some fundamental or essential shots that you should know in order to practice and improve them. The main shots which I will explain through the course of this article are the counter-hit, block, loop, counter-loop, lob and pushing. These terms may seem unfamiliar if you’re just starting out in the sport but don’t worry that’s to be expected and everyone needs to start somewhere. However, by the end of this article, I am sure you will a better understanding of what each shot requires. 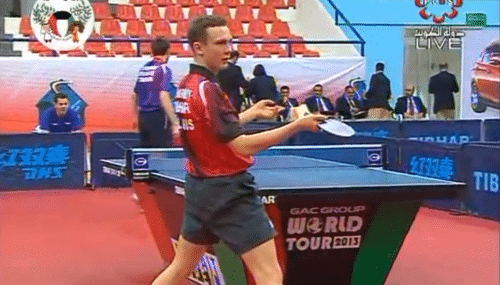 This is the most basic shot for a table tennis player to have in their arsenal. It is generally not often used during gameplay but is an essentially shot when warming up with your opponent. Basically, you are hitting the ball with your forehand diagonally to your partner’s forehand which he reciprocates. The block is an important choice of shot for both the beginner and experienced player. The backhand block is the more commonly used shot out of the forehand/backhand. This is because players tend to counter loop on their forehand rather than block (which we will get to shortly). Basically, you use the block to return a quick loop from your opponent. The block is basically a defensive shot, but if used correctly can be very devastating. The “loop” is named according to the arching motion the table tennis ball makes as it travels through the air. Despite its strange name, the backhand and forehand loop is probably the most widely used shot in table tennis. It is further subdivided into “backhand loop” and “forehand loop” in which both shots you finely stroke the ball generating topspin. 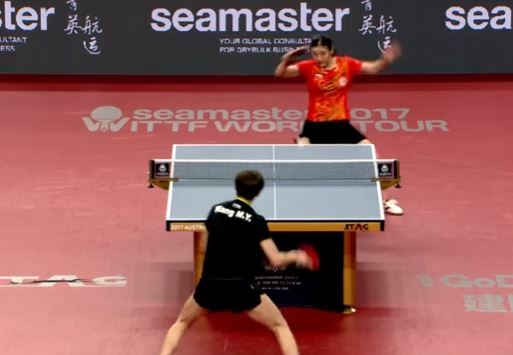 This topspin results in the arching motion of the ball and results in the ball “kicking” when it hits the table making it difficult for your opponent to return. The other related shot, which often requires much more practice is the forehand/backhand counter loop in which you loop your opponent’s loop by adding your own spin back onto the ball. This can be another very effective shot if used correctly, but at the same time, it has a high degree of difficulty. During play, there will be times when you are pushed back from the table resulting in you having to lob. Lobbing is when you hit the ball high into the air resulting in an elevated bounce when the ball lands on the table. Generally when lobbing you want to make the ball travel as high as possible with some added spin to the ball. This adds a degree of difficulty to the shot and increases the chances that the opponent will either mishit the ball into the net or hit it off the table. Lobbing like most other table tennis shots requires a lot of practice in order to perfect the right bounce and spin to add to the table tennis ball. The push shot is when you get underneath the ball, stroking it finely and generating spin. It is often a defensive shot used to make it difficult for your opponent to loop the ball strongly back onto the table. 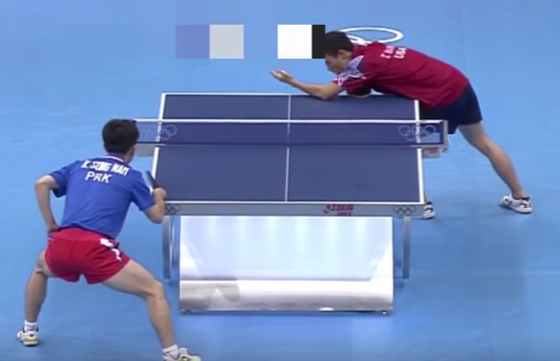 Table tennis pushing is further subdivided into short pushing and long pushing. Long pushing is what we discussed above where you push the ball long making it difficult for your opponent to loop. Short pushing is when you push the ball just over the net (i.e. the ball bounces twice) and is used to prevent your opponent from looping the ball. It is best described as a positional shot. Generally, I have found that long pushing is the more commonly used shot amongst beginning players, but as you progress to a higher level in table tennis then you will find short pushing becomes essential. If you have struggled to understand any of these concepts that I have outlined then I would suggest you consult or discuss what you are unsure of with a coach. If you are already being coached your table tennis coach would be able to show you personally how to play each shot. In nearly all sports, power is valued: the hardest pitch in baseball, the hardest shot in hockey, the sharpest punch in boxing, the strongest serve in tennis. It probably isn’t a coincidence either that the top players in each sport often exhibit that trait of raw power. Nonetheless, finesse players succeed at all levels in every sport – with table tennis being no different. A finesse player can be easily and accurately defined as one that focuses on shot placement as opposed to overpowering the other player. When executed correctly, a game plan based on finesse can be successful and very difficult to play against. In table tennis one of the most effective ways to implement smart shot placement is to find your opponent’s weakness. The backhand is traditionally a stroke that players can generate much less power with than the forehand, so consistently putting the ball there will reduce the likelihood of your opponent scoring a put-away shot on you. Another advantage to doing this is that often times your opponent will become frustrated with their inability to make a big shot and try to force something to happen – namely by trying to hit a forehand where a backhand is the only real option. If they do this, they’ll be handcuffed and consequently put the ball in the net, off of the table or produce a weak return that you can use to take control of the point. A second devastating weapon that players looking for strong shot placement can use is the drop shot. If an opponent is playing back off the table and the rally consists of a pattern of long strokes, simply tapping the ball over the net with no power can do wonders. Your opponent will need to hurriedly try to move up to get the ball back, and with their only priority being a safe return that won’t lose them the point right then and there, you will find yourself set up for a shot to finish the point. It seems that Quentin Robinot’s behind-the-back shot against Kiril Barabanov during the Kuwait Open has gone viral! The video was uploaded on 20th February and already it has over 1,000,000 views on YouTube. Kiril’s reaction was class! The shot has also received mainstream media coverage, featuring on; Mashable, The Guardian, Yahoo, MSN, and The Sun. If you haven’t yet seen the video (where have you been?!) you can check it out by watching the video below..
You’d be wrong to think that the behind-the-back shot is a new thing. The ‘trick shot’ has been around for years and I’ve found a number of great past videos on YouTube to prove it. The Bradley Evans one is great because of the surprise, celebration and the fact that it won him the match! If you would like to have a go at playing the “behind-the-back” shot then here are a few tips. Practice it in training – It may seem like these players have just pulled this off as an instinct (which is partly true) but they’ve all also spent time perfecting the shot in the training hall. The fact that it went on is not a complete fluke. Also, you’ll never react in that way in a match unless you have some degree of muscle memory for the shot and your brain has it stored away somewhere as an option. Keep your bat angle closed – The natural angle of your arm as you reach behind our back will give you an open bat angle. You will realize this after the first few practice attempts. We all know that hitting the ball flat with an open bat angle is going to send it flying off the end of the table so you will need to make an effort to close the bat angle in order to keep the shot on the table. Rotate your body to the right – Unless the ball is played really close to your left hip (I’m writing for a right-handed player) you are going to need to rotate your body in order to reach the bat. By rotating/twisting your body to the right you bring your right shoulder left and give yourself an extra 20cm of reach. I’ll leave you with some stills I took from the Robinot video. Click it for an enlarged version!